You’ve been reading about how I’ve been shoveling the snow and doing other winter outdoor tasks, in my SafetyGirl boots. Last night I came home to about 6″ of snow in my driveway – maybe more. Whatever it was, my AWD with relatively new tires couldn’t make it. Of course my parents’ snow shovel broke in half, leaving me with only a push broom. Last post I think I said the broom was optimum for up to 4″ of snow. We had far more than that. By the time the sun went down I had only done a half-decent job on part of the driveway, and my boots and pant legs were soaked. It occurred to me then that I hadn’t waterproofed my boots. My first pair of workboots was a beige pair my dad bought me in college when I started hiking. It was the second gift he ever picked out and purchased for me. They were hidden in his closet Christmas morning and after all the other gifts were open, he told me to go look in his closet for my final gift. Of course I saw the boots in the box in the corner, but I instead yelled down, “an old pair of your tennis shoes!! Thank you so much!” He laughed. 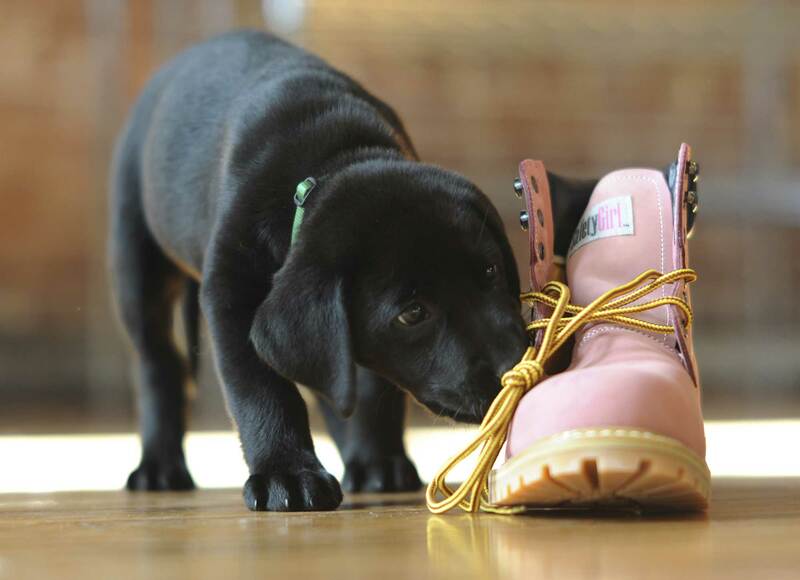 “Do you know how hard it was to find construction boots in that size? I had to go to the boys’ section.” Back in the day, women didn’t wear construction boots, and petite women doubly didn’t wear clunky construction boots. “You know we have to waterproof those before you wear them. Even though the box says they are waterproof, that just means they sprayed a coating on them, and that coating eventually wears off – it’s the nature of the manufacturing process. You need to work it in by hand to really seal them.” He took his shoe kit down and together we rubbed in the waterproofing conditioner, then I buffed with a soft cloth. “Make sure you get good around those seams and the sole. That’s where water’ll get in.” After the first liberal coat, we set the boots in front of the register to melt the conditioner into the leather, then repeated the process the next day. “You’ll need to do this every year, before winter, if you want them to last.” I watched the boots turn a pristine, soft beige to a dark and smooth brown before I ever wore them. I was so disappointed that we had ruined my pretty boots just for the sake of keeping my feet dry. In the 90’s a petite girl wearing mini construction boots was not the norm, and my dad got a kick of out it whenever he saw me in them. I wore those things everywhere for a long time, then when they started to show their age, I relegated them to hard work – hauling wood and shoveling in the winter, mowing and operating a stump grinder in the summer. Anyway, it took me fifteen years to kill those boots, and kill them I did. The toes were cut, the tongue was black where the laces had worn them smooth, the soles were no longer nubby. My then-husband told my dad before Christmas one year, “you better be the one to get her replacement boots. I have heard the story too many times to think I could ever replace them.” My dad got me a new pair of boots that Christmas, but he wrapped them and put them under the tree with the other gifts. They weren’t the cute, tiny boy version (by now they made small adult sizes for women). And we didn’t waterproof them together. I took them back home with the rest of my gifts, and they remained in the back of my closet. My husband and I didn’t hike, and I had a pair of old tennis shoes I used for shoveling and mowing. They are in the back of my closet, unwaterproofed, today. These were my thoughts, taking all of a minute, after I was done sweeping my driveway last night. Before the snow started again in earnest, I headed off the hill to Andy’s for the night, in my pink boots. This morning, after I had the coffee on and Andy was in the shower, I took my bedside coconut oil (which is excellent for your skin) and rubbed the boots down quickly. Any stable solid fat or pliable wax will work in a pinch if you don’t have boot waterproofer but you should use a proper conditioner as soon as you get a chance. I rubbed thick globs along the reinforced stitching and the crease where the leather upper meets the lug sole. I rubbed it in briefly with my hand and put them on for work today.